Issues relating to tax evasion and tax enforcement have attracted increasing attention in recent years, especially after the 2008 financial crisis and subsequent fiscal imbalances of governments around the globe. Accordingly, many initiatives have been started at the national and international level to combat fraudulent behaviour, such as information exchange among tax administrations (OECD 2014) or measures against base erosion and profit shifting of multinational firms (OECD 2013). At the same time, tax researchers, armed with large administrative datasets and new strategies to identify causal relationships, have provided deeper insights into the causes and consequences of tax evasion (see Slemrod 2016 for a comprehensive survey). In a new paper, we contribute to this literature by studying the determinants of individual compliance decisions within a framework of third party reporting (Paetzold and Winner 2016; see also Kleven et al. 2011). In particular, we focus on the existence of evasion spillovers, with taxpayers becoming more likely to start cheating when being exposed to a non-compliant environment. So far, evidence of such evasion spillovers is scarce and limited to laboratory experiments (e.g. Fortin et al 2007). Our paper provides the first field evidence on how evasion spillovers influence individual compliance decisions. To detect non-compliance, we first match tax return data with employee–employer data to obtain the residence and workplace location of the taxpayers. We then calculate the driving distance between the two locations (with a route planner as commonly used in various navigation devices) and use this as an approximation of the true driving distance. Based on this true driving distance we determine the justified commuter allowance bracket. A comparison between the justified allowance bracket and the claimed allowance bracket reveals who evades taxes. We classify individuals as misreporters when they either over- or underreport their justified allowance bracket. To uncover systematic cheating by commuters, we study discontinuities in misreporting around the allowance bracket thresholds. In the case that individuals systematically over-report their bracket eligibility, we should observe a discontinuity in the fraction of misreporters at the bracket thresholds. In contrast, if people would just report a noisy estimate of their true eligibility without any cheating, we should observe symmetric increases and decreases in misreporting around the thresholds but no discontinuities. Figure 1 displays the fraction of misreporters by bins of commuting distance. We observe a sharp reaction of taxpayers to these thresholds. The closer commuters live to a respective bracket the more prone they are to misreport their allowance claim. Overall, more than 60% of the individuals closest to the brackets misreport their actual driving distance to the workplace. More importantly, the fraction of misreporters falls discontinuously at each bracket threshold, suggesting that taxpayers are aware of the allowance scheme's structure and its incentive to over-report. 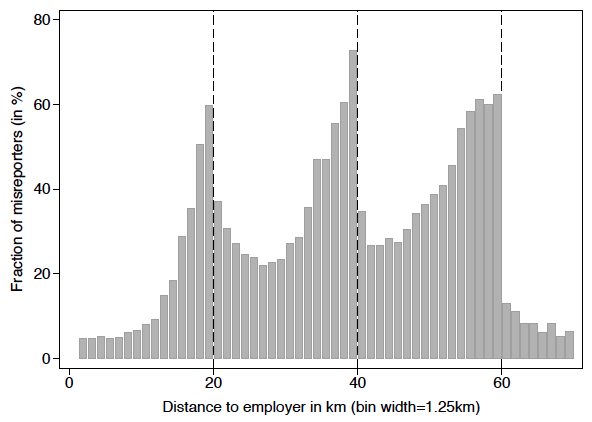 Notes: Reporting behaviour of commuters by their distance to the workplace (bin width=1.25km). For each bin, the fraction of misreporters (defined as commuters who either over- or under-report their allowance bracket) are shown in bars. The dashed lines represent the thresholds where the allowance discontinuously increases to a higher amount (at 20, 40, and 60 km, respectively). Allowance recipients between 1995 and 2005 are included. While it is striking how widespread non-compliance with the commuter tax allowance is, it is also interesting to notice that a substantial number of individuals still report their commuting distance honestly. We make use of the richness of our data to address this variation in cheating. Specifically, we study how the individual evasion decision is influenced by the compliance behaviour of other taxpayers in one's vicinity. In order to study such evasion spillovers, we focus on a sample of job changers moving between employers that differ in the share of workers overstating their commuter allowance. Hence, our identification strategy exploits variation in job changes to reveal spillover effects from the new work environment on the individual compliance decision. The results obtained from our sample of job movers show a significant impact of a taxpayer's work environment on the individual compliance decision. Moreover, we observe asymmetric effects of increases versus decreases in co-worker cheating shares when individuals move between companies. 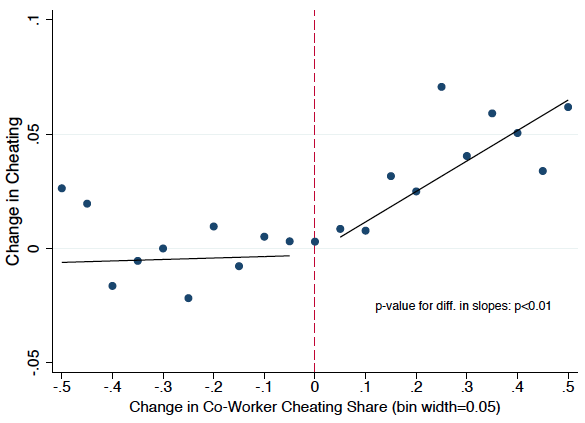 Figure 2 plots the change in cheating behaviour of job movers against the change in co-worker cheater shares. Importantly, job changers who move to a firm with a higher fraction of cheaters start over-reporting much more after they move. In contrast, those who move to firms with a lower fraction of cheaters tend not to change their reporting behaviour. This asymmetry in the effect of the job change rejects explanations based on sole firm-level mechanical effects, such as some firms thoroughly screening the commuter allowance claims of their employees while other firms do not. In fact, substantial firm-specific effects on the reporting behaviour would not translate into such an asymmetric impact of an individual's previous co-worker cheating share on current behaviour. Instead, the asymmetry suggests a behavioural spillover from co-workers and colleagues. Notes: The figure plots changes in cheating behaviour from the year before the job change to the year after the job change versus the change in co-worker cheating shares across the old and new employer. We group individuals into 0.05 percentage point-wide bins on changes in co-worker cheating shares (the X-axis) and then plot the change in mean cheating within each bin (the Y-axis). The solid lines represent best-fit linear regressions estimated on the microdata separately for observations above and below 0. The case of the Austrian commuter allowance points to the deficiencies of poorly-designed tax schemes which combine sharp discontinuities in the deductible amount with eligibility criteria that are very difficult for the government to verify. Our findings show that taxpayers respond strongly to such schemes. Second, our evidence suggests that third-party reporting is not a panacea against tax evasion, especially when employers have very little incentive to accurately record such claims. Finally, we demonstrate that non-compliant behaviour is systematically influenced by a taxpayer’s social environment, a finding that is also relevant for enforcement strategies. When evasion behaviour between taxpayers is causally linked, then policies that lower non-compliance of one group of taxpayers will have spillover effects on other groups of society. Fortin, B, G Lacroix and M-C Villeval (2007) “Tax evasion and social interactions”, Journal of Public Economics, 91: 2089–2112. Kleven, H, M Knudsen, C T Kreiner, S Pedersen and E Saez (2011) “Unwilling or unable to cheat? Evidence from a tax audit experiment in Denmark”, Econometrica, 79: 651–692. OECD (2013) Addressing base erosion and profit shifting, Paris: Organization of Economic Co-operation and Development. OECD (2014) Standard for automatic exchange of financial account information in tax matters, Paris: Organization of Economic Co-operation and Development. Paetzold, J and H Winner (2016) “Taking the high road? Compliance with commuter tax allowances and the role of evasion spillovers”, Journal of Public Economics, 143: 1–14. Slemrod, J (2016) “Tax compliance and enforcement: New research and its policy implications”, Ross School of Business, Working Paper No 1302. Tax breaks for commuters are popular tax policy tools in many countries. They are sometimes included in general work-related deductions (e.g., France or Italy), designed as a single allowance for commuters (e.g., Germany, Netherlands, Denmark) or come in the form of tax-free benefits paid by the employer (e.g., the US). In 2014, tax authorities tightened enforcement by introducing computer-assisted software which checks actual driving distance as well as eligibility of the claimant. Unfortunately, it is too early to study the effect of this change in enforcement.